You love to play Clash Royale, With all the rules. But what if we bring the best private server for you. The Clash Royale 2.7.1 Private server. With the build name of FHX Clash Royale, 2019 Apk is the best private server you should go for. Just like FHX’s clash of clans server we discussed earlier, This CR 2019 private server has to offer so much for the game. The most undesired scenario here is that the Private Servers for the Clash Royale game are being dried up. Many developers have left the scene. Some went more indulged in COC servers. So the Clash Royale game is not that fun anymore. But there are still some developers around making some good Private servers even in 2019 too. That’s why we brought the FHX Clash Royale 2.7.1 APK for you guys. Here is some feature you would love to have in the game. Like all other private servers, This updated FHX 2019 server comes with Unlimited resources and custom game-play features. Although there are many bugs found in the initial version of the game. But still, somehow this is the best working one in early 2019. The main features include The most demanded Unlimited Coins, Unlimited Elixir, Unlimited Gems. So that means you can buy anything you want in the game without spending the real money for a bunch of gems and coins. Besides this, the FHX Royale 2019 Apk comes with modified cards. These modified or Custom cards come with extra high Area Damage, HitPoints, and Speed. 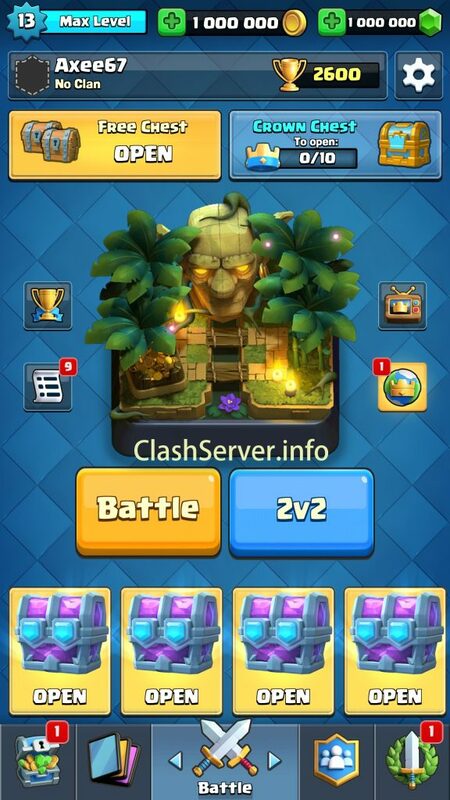 The Private server is just like the Clash Royale 2.7.1 Mod apk, but it has some extra features added to the main game. Custom Cards from Clash of Clans too. PVP or 2 players mode enabled. Clash Creation and participation added. There are rumors that the teams behind this FHX Private Server will come up with the updated gameplay. As you know we have recently got the latest CR April 2019 update of the game. So the FHX Server 2019 v2.7.1 is on the verge of release. We will make sure to bring it to our fans. This private server is based on FHX 2.7.1 apk. So if you want the updated version of the game you have to wait. But if you want to give it a try. You can go for it. Developers: FHX private server builders. The most common issue with this FHX Clash Royale 2019 Apk is the un-stability of the server. The main reason behind it is the server non-responsiveness. So I can’t guarantee you to remain connected with the game. There are chances that you see that arrogant 50% loading stuck error in the game. But that’s how private servers work. Somehow if you are not satisfied with this FHX Server. We recommend you to pay a visit to our main CR Private server page and get the updated working private server.